SPRING HAS SPRUNG WITH SUZANNE GOIN! Remember that decision of not getting new cookbooks in 2015? I am actually proud of myself because I arrived almost at the end of March without caving. Only one cookbook purchase, which at some point I will talk about here. However, the universe conspired against me. In a perverse turn of events a certain good friend of mine sent me not one, not two, but TWELVE cookbooks. I’ll now pause so that you can close your jaw and regain your composure. Better yet, they were in electronic format, so no trees were harmed. One of the gifts was Susanne Goin’s The A.O.C. Cookbook which I fell in love with instantly. I do own her other book, Sunday Suppers at Lucques, and have been to that restaurant in Los Angeles twice during our sabbatical a few years ago. The place has a wonderful vibe, and fantastic food with a country French feel centered on local ingredients. I was not at all surprised by how much I loved the recipes she chose to feature in A.O.C. Plus, what a clever name for a wine bar, I definitely want to stop by next time we are in L.A. The recipe I chose to inaugurate the book perked my interest because it’s simple but at the same time quite sophisticated. The different components go together perfectly, the dish satisfies without being heavy, it’s all about balance, harmony, but with contrasting flavors and textures. I think it reflects well what Suzanne’s cooking is all about. Plus, it really looks like spring on a plate… What could be more appropriate now? For the chicken marinade, heat a small sauté pan over medium heat for 1 minute. Swirl in the butter, and when it foams, add the diced shallots and the thyme; sauté for about 2 minutes, until the shallots are translucent. Add the vermouth, and reduce by half. Transfer to a baking dish, and let cool a few minutes. Whisk in ½ cup Dijon mustard, 1 egg, the chopped tarragon, and a pinch of black pepper. Place the chicken legs between two pieces of plastic wrap, and pound them with a mallet to an even ½-inch thickness. Remove from the plastic wrap, and slather the chicken with the marinade, making sure to coat both sides well. Refrigerate for at least 4 hours. Make the vinaigrette: Whisk the egg yolk in a small bowl with the remaining 1 tablespoon Dijon mustard, the red-wine vinegar, 1 tablespoon lemon juice, ½ teaspoon salt, and a pinch of pepper. Slowly whisk in ¾ cup olive oil. Thin the vinaigrette with 1 teaspoon water or more if needed. Taste for balance and seasoning. Light the grill 30 to 40 minutes before you’re ready to cook the chicken and take the chicken out of the refrigerator to let it come to room temperature. Spread the almonds on a baking sheet, and toast in the oven for 4 to 5 minutes, until they’re lightly browned and smell nutty. Meanwhile, carefully lower the remaining six eggs into a pot of boiling water. Cook for exactly 6 minutes, and cool immediately in a bowl of ice water. When the eggs have cooled, peel them. Place the spinach, half the almonds, and half the breadcrumbs in a large bowl. When the grill is ready, place the soft-cooked eggs in the oven to heat up. Drizzle the chicken with the remaining 2 tablespoons olive oil, and place it on the grill skin-side down. Cook for 4 to 5 minutes, rotating once or twice after a couple of minutes to get the skin crispy. (The chicken will stick to the grill at first, but it will eventually release.) When the skin side is nicely crisped, turn the chicken over, and cook for a few minutes on the other side, until it’s just cooked through. Pour ½ cup of the mustard vinaigrette over the salad, and season with salt, pepper, and a squeeze of lemon. Toss well, and taste for balance and seasoning. 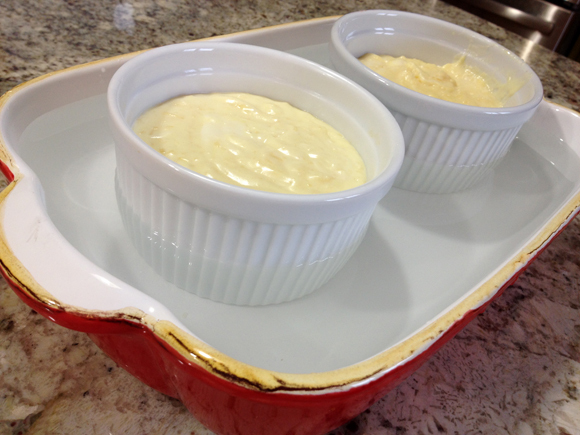 Spoon the hot pecorino pudding onto the center of six dinner plates. Arrange the spinach salad on top of the pudding, and place the chicken on top. Carefully balance an egg on top of each piece of chicken. Drizzle with ¼ cup mustard vinaigrette, and sprinkle the remaining almonds and breadcrumbs and the grated pecorino over the top. Place the breadcrumbs in a medium bowl. Heat a small sauté pan over medium heat for 1 minute. Add the butter, and when it foams, whisk in the mustard, thyme, and parsley. Remove from the heat, let cool for a few minutes, and then pour the mustard butter over the breadcrumbs, tossing to coat them well. 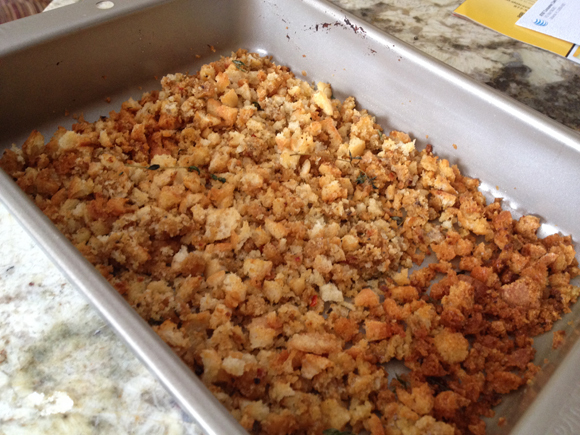 Transfer the breadcrumbs to a baking sheet, and toast them for 10 to 12 minutes, stirring often, until they’re golden brown and crispy. Heat a medium pot over medium heat for 1 minute. Add the butter, and when it foams, whisk in the flour, 1 tablespoon at a time, and cook for about 5 minutes, being careful not to let the flour brown. Slowly pour in the milk and cream, whisking constantly to incorporate it. The butter and flour will seize up and get pasty at first. Continue whisking vigorously as you add the liquid, and the mixture will become smooth. Cook for a few more minutes, until warm to the touch. Remove the pan from the heat. Whisk the egg and egg yolk together in a small bowl. Slowly drizzle the eggs into the cream mixture, whisking continuously until combined. Stir in the cheese, and season with a heaping ½ teaspoon salt. Pour the mixture into an 8-by-6-inch (or equivalent) baking dish, and cover lightly with foil. Place the baking dish in a roasting pan, and add hot water to the pan until it comes halfway up the outside of the baking dish. Place the pan in the oven, and bake for about 1 hour, until the pudding is just set. If you make the pudding ahead of time, be sure to take it out of the refrigerator to reach room temperature. When it does, heat it in a 350°F oven for about 20 minutes, until it is heated through and starts to brown slightly on top. Comments: For the most part, my cooking style is quite simple, reflecting our desire to eat well, but keeping in perspective our work schedule. But on weekends it’s possible to devote a bit more time to prepare a nice menu, even if it’s just for the two of us, which was the case in this particular meal. I took my time, doing all steps of the recipe at a leisurely pace, then assembled the dish in all its colorful glory! I used chicken thighs instead of whole legs, considered de-boning them myself, but then went with what I found at the grocery store ready to use, boneless, skinless pieces. The marinade kept the pieces very moist, they stood well to grilling. I more or less halved the whole recipe, but ended up making the full amount of the pecorino pudding, because I suspected we would love it as a side dish for another meal later. I was right, so if you are making this recipe just for you and your favorite person in the world, go for the full amount of pudding, it’s the same work for double rewards! The Pecorino Pudding… absolutely wonderful on its own! Another change I made was using slivered almonds instead of pine nuts. A few years ago I was getting ready to use pine nuts in a recipe and decided to munch on a couple after toasting. They were rancid, even though the bag was stored the freezer. Have you ever tasted a rancid pine nut? My advice: do not. I know it’s silly to avoid them, but let’s say I’ve been very happy substituting slivered almonds, and did the same for this recipe. I simply did not want to run the risk of ruining our special dinner. Please don’t cut corners and use store-bought bread crumbs. No bueno. Go the extra mile and toast your own bread crumbs, keeping them with a coarse texture. As we sat down and savored the meal, Phil said “this dish would be a star in the best Parisian bistrots”. Mission accomplished, Sally pats herself on the back, although patting Suzanne’s back would be more appropriate. The egg yolk self-transforms into a luscious sauce that envelops the flavorful chicken, and the pecorino pudding underneath provides the exact amount of sharpness, but with a soft and pleasant texture. What a great combination of components! Suzanne opened A.O.C. Wine Bar and Restaurant to mimic the atmosphere of the small wine bar at Lucques, where people would sit, eat hours d-oeuvres, have a great time while waiting for their tables. Her idea was to have a wine bar of sorts, in which people could order a few small dishes and informally share. Before you say “tapas bar”, let me assure you it is not at all the case, and it bothers Suzanne when people insist on defining A.O.C. that way. Think about more elaborate, bigger dishes that happen to be perfect to share. As usual for my cookbook reviews, instead of giving you a complete list of recipes, I will offer my favorites of each chapter. A delicious collection of recipes, my favorites probably Bacon-Wrapped Dates with Parmesan, and Torta Gorgonzola with Walnuts in Honey. As Suzanne points out, honey and blue cheese are a match made in heaven, adding walnuts brings the additional textural component that fits right in. I pretty much drooled over each and every recipe, but the Chicken Liver Crostini with Pancetta went to the top of my list, after reading that Suzanne’s intention was to “make the most delicious chicken-liver pate I could”. Cannot beat that endorsement. I also would love to try my hands at the Pork Rillettes with Pickled Onions and Cornichons, because rillette was one of the appetizers I ordered most often while living in Paris. Each place seems to have a slightly different take on it, not only as far as spices, but the way the meat is prepared and shredded. This chapter as well as all others coming after it will be divided by season. Growing up in Brazil, where seasons are not well-marked, it took me a while to adapt to the idea of seasonal cooking. But, it’s something I embraced and now appreciate when a cookbook focus on it. My favorites of this chapter would be Sweet Pea Pancakes with Dungeness Crab and Red Onion Crème Fraîche… Fattoush Salad with Fried Pita, Cherry Tomatoes, Crumbled Feta and Sumac… and Roasted Kabocha Squash with Dates, Parmesan and Pepitas. You can see how Suzanne is very creative with her salads, and you could order two or three of them to make a complete meal, no meat needed. Remember? A.O.C. is all about sharing, a place that seems perfect to go with a few friends. Maybe my favorite chapter? Not sure, but a serious contender. Sharing a few favorites: Alaskan Halibut with Carrot Puree, Asparagus, and Pistou… Wild Salmon with Spinach Soubise, Wilted Leeks, and Meyer Lemon Butter (OMG! )… Black Bass with Fennel Puree, Winter Citrus, and Green Olives in Green Harissa. Notice how long the names of her recipes are? Well, at least you know exactly what you will be enjoying! 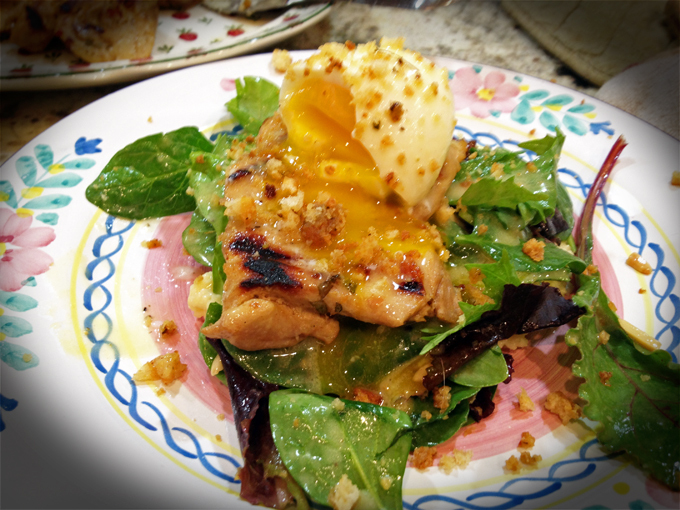 I am of course very partial to the opening recipe, Mustard-Grilled Chicken with Spinach, Pine Nuts, Pecorino, and Soft Egg, which was featured in this post. But then there’s also Lamb Paillards with Risotto Carbonara, English Peas, and Chanterelles… or her Grilled Chicken with Fresh Garbanzos, Corn, and Chile-Cumin Butter. If you are feeling adventurous, consider her Braised Duck with Madeira, Kale Stuffing, and Dates. Sounds like heaven to me! If pork is more what you are looking for, she has a great looking recipe for Pork Confit with Caramelized Apples and Cabbage in Red Wine. I really enjoyed reading her introduction of this chapter. Quoting from the book: “I feel I walk the line of respecting and showing off the inner beauty and inherent deliciousness of the vegetables, while also giving them a little dressing up or a nudge of sexiness and surprise”. That says it all. She really shines in her preparation of veggies. My favorites, pretty hard to pick: English Peas with Saffron Butter and Pea Shoots,… Crushed Corn Pudding with Poblanos and Queso Fresco… Balsamic-Glazed Brussels Sprouts with Pancetta… and Turmeric-Spiced Root Vegetables with Kaffir Lime Yogurt and Mint Chutney (OMG #2). My favorites of this chapter: Brioche with Prosciutto, Gruyère, and Sunny-side-up Egg… Roasted Cauliflower with Curry and Red Vinegar… Lamb Meatballs with Spiced Tomato Sauce, Mint, and Feta. A list of all cheeses you can find at her wine bar. Mind blowing. If you are expecting that boring list found in so many books, “hard cheeses, soft cheeses, blue cheeses”, with a few meager examples of each, be ready to be absolutely amazed. She lists hundreds of types of cheese, most of them I have never heard of. They are divided by type of milk, and country of origin. Since I’ve never met a cheese I did not like, I bet I would welcome any of them at my table. Each cheese has a reasonably detailed summary of its “personality”. A real masterpiece of a chapter to close a great cookbook. A.O.C. brings good balance between short stories, Suzanne’s thoughts on food, and the detailed recipes are paired with excellent photography: the icing on the cake. 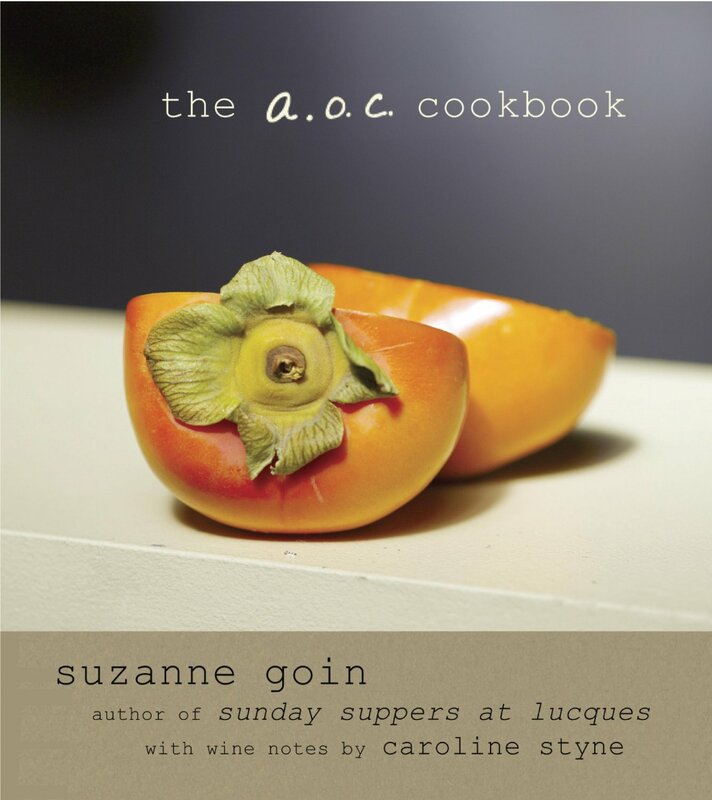 Suzanne, thanks for giving me permission to publish one of your recipes, and I look forward to visiting A.O.C. in person in the near future! THREE YEARS AGO: Still got stout?